I have mixed feelings about teaching Election Day with my students. Of course, Election Day is an important day in our country. We are choosing our leaders. 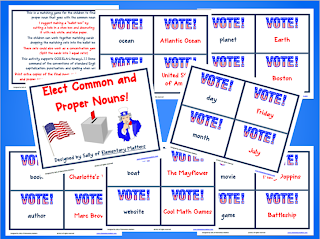 My little second graders certainly won't "get" the Electoral College process, but they do need to understand how an election works. My plan is to do some election day activities without getting into detail about any of the specific candidates. 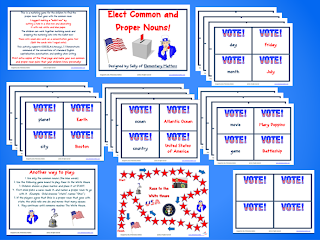 I've made the above freebie to practice common and proper nouns. It has an election day theme, but never mentions the candidates. The product to the left is the same, but has lots more cards, and a couple of other ways to play.